Kinesiotape has been around for more than 25 years. And up until 6 years ago I had never even heard of it! I was speaking at a national conference in Dallas. Before my session started I was walking in the hall outside of the conference room. There were several vendors set up in booths and I was passing the time looking around. I saw one of my buddies talking to a vendor at a booth with a big sign that said “Rock Tape” – so I walked over and said hi. My friend introduced me to a guy named Greg. It turns out that Greg was the founder of Rock Tape. It also turns out that Greg is a really smart guy. He is an MIT grad and former VP of several very successful companies. And here he was at a booth at a health related conference selling tape. I figured there must be something to this stuff… So I decided to learn more about it. And once I started using it – I loved it. But more importantly my PATIENTS loved it and the (almost) instant feeling of relief they got when I put it on them. 6 years later I use Rock Tape daily in my physical therapy practice. And I’ve developed 2 novel taping techniques for knee pain that have been amazing (according to my patients). I’ve never written about those applications… Until now. I decided to share them because I haven’t seen them anywhere else. And they are super easy to do. And they work. Fast. So if you are ready to give them a try – go grab your Rock Tape (or whichever brand of kinesiotape you like) and a scissor. Oh yeah – you should also put on a pair of shorts or some pants that are loose enough to roll up above your knees. This first application is my go to technique for all kinds of knee pain. The only contra-indication (i.e. reasons you should NOT use this technique) is if you have any open wounds / cuts / abrasions or scabs on your knee. But that’s true for all taping – I just thought I should remind you. Once you check those out you are ready to go. 1. Cut a 4″ piece of tape and round the edges. 2. Put the foot of your affected leg (the one you have pain in) on a chair. 3. Remove the top portion of backing and firmly apply the top tag end of the tape right above your patella (aka knee cap). Really make sure the top 1/2 to 1″ of tape is securely taped to your skin. 4. Bend your knee as much as you can by slowly squatting forward. 5. Remove the backing and stretch the tape to 50%. An easy tip for this is to stretch the tape to 100% and back off by half. 6. Secure the stretched tape over your knee cap towards your tibial tuberosity. Tape slightly over (on top of) the tibial tuberosity. NOTE: Leave about 1/2 to 1″ of un-stretched tape for the loose tag end. 7. Flatten down and secure the tag end of the tape. Look at the image and locate the Inner Head – that’s the one we are interested in. This kinesiotape application is a bit tricky to do by yourself. I’d highly recommend that, for best results, you find someone to help you (an assistant). Have them read through this description with you. 1. Cut a 7″ piece of tape and round the edges. 2. Lay on your stomach with your affected leg straight. Dorsiflex (pull your foot up so you get a stretch in your calf) your foot and straighten your knee. 3. 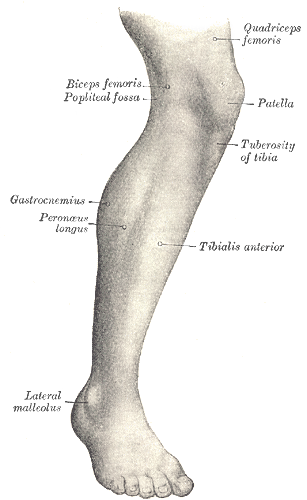 Have your assistant remove the top portion of backing and firmly apply the top tag end of the tape right below the inner gastrocnemius (where the muscle belly meets the Achilles tendon). 5. Secure the stretched tape over your inner gastrocnemius towards the bend in the back of your knee. 6. Flatten down and secure the tag end of the tape. If the application was done correctly AND your knee problem is related to muscle and/or joint pain then you should notice a reduction in tightness and discomfort of your knee. Many of my physical therapy patients tell me that they feel a difference (i.e. decreased intensity of pain, decreased tightness) within minutes of applying the kinesiotape. You can leave the tape on for several days (refer to the manufacturer recommendation for this). It will stay on during bathing (bath or shower) and exercise. If you feel any discomfort or itchiness that’s too much to bear or if you simply want to be done with it – take the tape off. I recommend that you remove the tape while it is dry versus after bathing. The water and heat seem to activate the tape and make it harder to remove. If you decide to give this a try – I hope you find it to be as beneficial as my patients do. Please feel free to post your comments. Good Luck!